Although the main aim of the BBS is to record birds and habitats, it would be useful if you could also record sightings or signs of mammals on your BBS square, as these are used to produce mammal population trends. 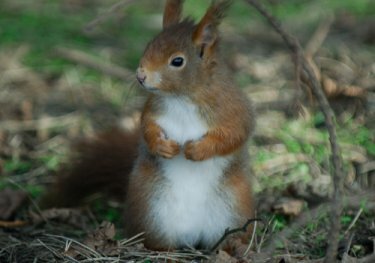 While carrying out your bird surveys, please count all live mammals seen during your Early and Late BBS visits, and make notes of any signs of mammals. Any estimate of the numbers of a particular species on your survey visits (no matter how rough), is more useful than recording ‘too many to count’, ‘present’. You can note down mammal records on your Field Recording Sheets alongside your bird records, in the transect section they or their signs are observed in. There is no need to make special visits to count mammals, nor to record them in distance bands. The main species of interest are the easily-observable mammals listed below. There is no need to make a special effort to look for small mammals, bats, etc. Did you look out for mammals? Recording mammals is optional. Please enter ‘Y’ if you looked out for mammals/signs (even if you saw none - this is still valuable information) , or enter ‘N’ if you did not participate in mammal recording (i.e. indicating that you may have seen mammals or signs that you did not record). covers both your Early and Late visits, and additional visits during the season. Enter the visit (E for Early or L for Late) and transect section (1 – 10) you saw the mammals or signs. For observations made during the season but not during your core visits, enter the records on the first section of either core visit. If you are submitting data online, mammal records can be taken straight from your Field Recording Sheets and entered online, alongside the bird records, in the relevant transect sections and visit. if submitting data on paper. For other species, enter the name but leave the code blank. • C Counts of live animals during your Early or Late BBS visit (please count all live mammals seen). • D Dead animals recorded during any visit this season (no counts). • F Field signs recorded during any visit this season, e.g. tracks, droppings, molehills (no counts). • L Local knowledge of presence (during this season only), e.g. from a landowner (no counts). • S Sightings of live animals from additional visits to your square during this season (no counts). ‘This season’ denotes the period from January to July of the year in which you complete the survey. Field signs must be current, including active setts, dreys and fox dens. For example, for Badger setts, use the ‘F’ (field signs) code only if there are definite signs of recent activity, such as a clear sett entrance and spoil heap. Counts should always made when using code C, and only when using code C. Do not count dead animals, field signs, or of live animals seen on additional visits to your square. Do not use code S for live animals seen while carrying out your BBS visits (since these should always be counted). if you submit your data on paper. • When entering data online, if you state that you did not look for mammals you will not be able to input mammal records for that visit, and this cannot be edited at a later stage. • The paper summary sheet covers both your Early and Late visits, and additional visits. • Please remember to enter ‘Y’ if you looked out for mammals, or enter ‘N’ if you did not participate in mammal recording. If you actively looked, but saw no mammals/signs, please remember to enter 'Y' in the 'Did you look out for mammals?' section. • For observations made on additional visits to your square, enter the records on the first section of either core visit.